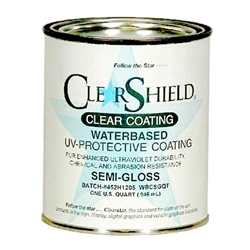 ClearShield® is your first choice for all non-water-sensitive applications. Ultraviolet inhibitors protect the substrate, ink and the clear coating itself. These non-yellowing clear coating have excellent exterior durability and are highly flexible. Use ClearShield® on most substrates, including waterproof canvas, vinyl, banners, fiberglass, wood, metal, plastic, and paper. Apply it over solvent-based inks and most water-based paint systems.